Abstract: I develop a model in which a terrorist organization delegates tasks to recruits. The organization wants to assign sensitive tasks to the most reliable recruits but cannot perfectly identify commitment to the cause. In equilibrium, the organization interprets the desirability of a recruit’s opportunities in the civilian sector as a credible signal. When the recruit has attractive options available, the organization infers his commitment and gives him a sensitive task; when it is low, the organization conservatively assigns him a non-sensitive task. 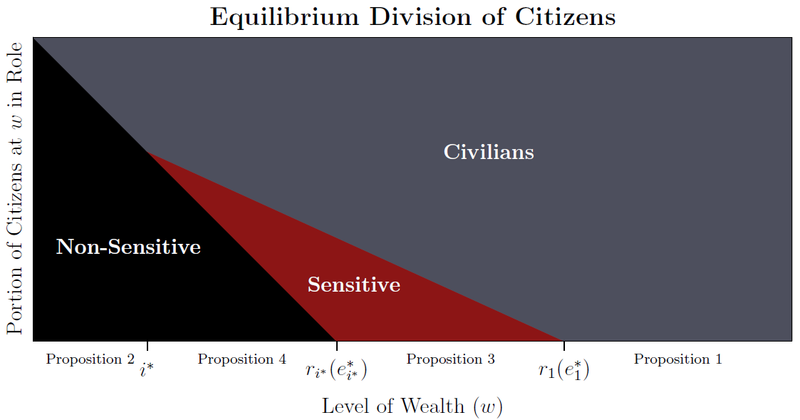 I then extend the model to allow for a third-party to endogenously improve economic conditions among the civilian population. Despite raising the opportunity cost of terrorism, such subsidies can increase violence because they help the organization identify committed types. Published in the Quarterly Journal of Political Science.